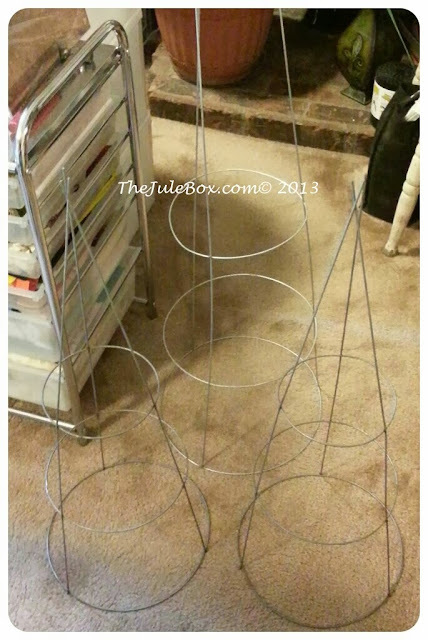 "The Jule Box Studios": From Tomato Cages to "Wintery Forest Trees"! From Tomato Cages to "Wintery Forest Trees"! Hello and happy upcoming weekend!! 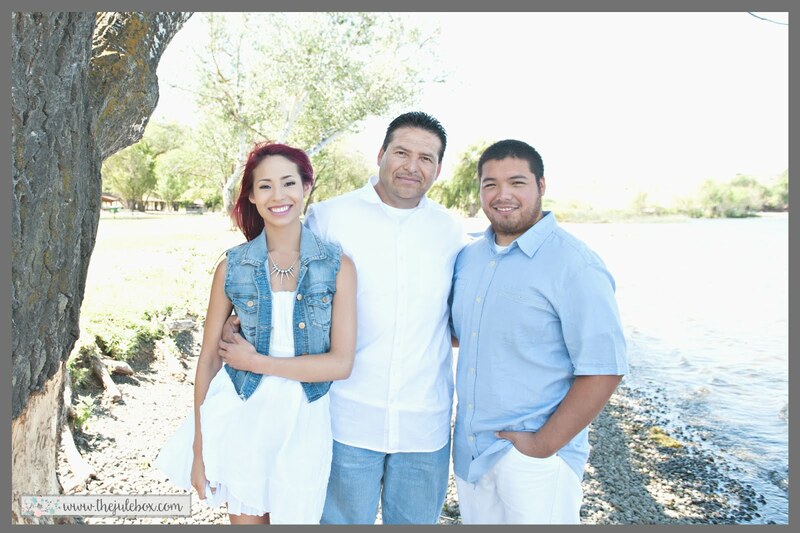 Today's post is about transforming something that was purposed for one thing... into another! If you're a gardener, tomato cages are something you may be familiar with. I used mine for my gardens for as long as I have had a garden! The thing is that you buy these in the Spring for when your tomatoes are planted and then they grow in abundance in the Summer, which is when the cages are handy, then when they are about done after the last of the harvesting in September or so, I usually remove them and put them away in the garage for the Winter and they'll be there for when I need them again for the next Spring! Changing the use of them makes them very versatile and so this way, you can about use them throughout the entire year! Why not if they're just gonna be collecting webs in the garage or shed right? 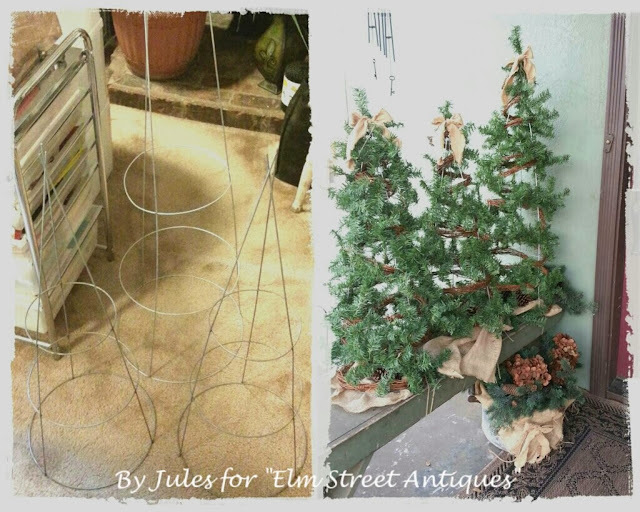 I made a topiary years ago using the largest cage and I always wanted to make Christmas trees out of a set of them. 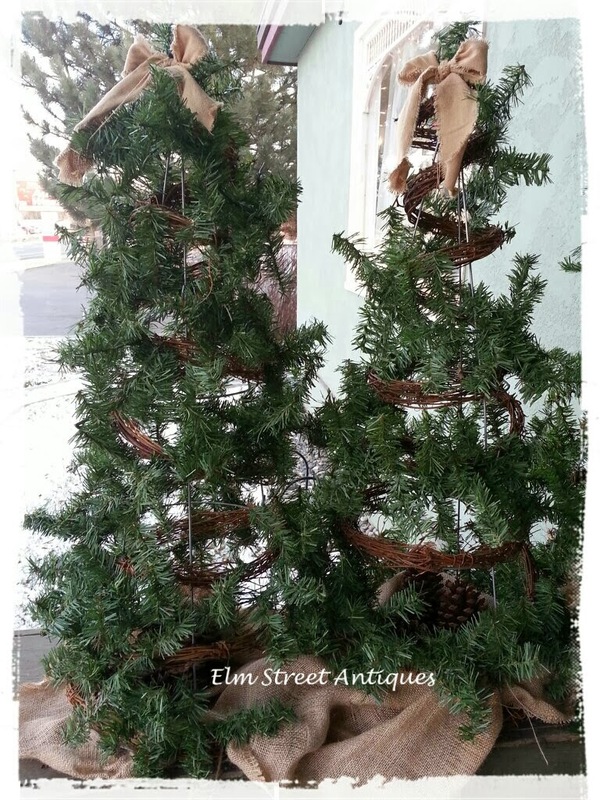 The opportunity came to make them for "ESA" (Elm Street Antiques) and I was thrilled they let me do that!! You can decorate these to fit your taste and decor! Be totally free to experiment with different colors and seasons! Now, they humbly grace the porch of the store (it was an old house) and right by the front door! :) Thank you Paula and Terri!! 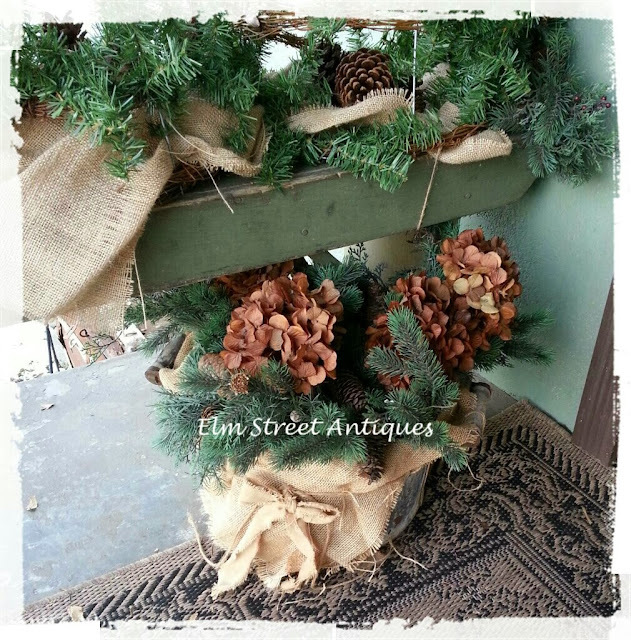 Love the look of burlap in Vintage and Shabby decor! From this................................... to this! What a fun project! 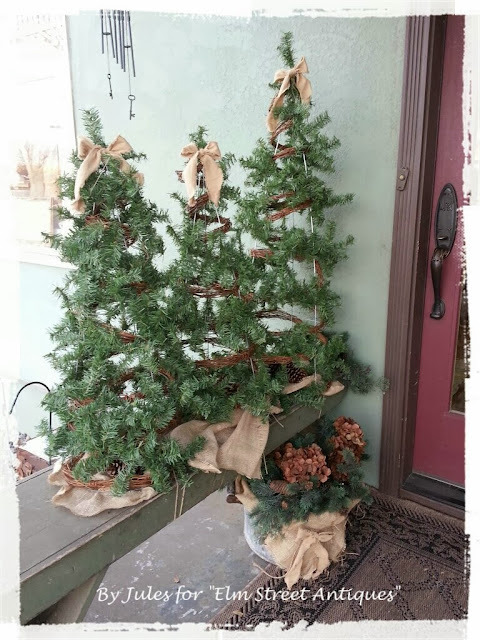 ~Old Burlap fabric, for the bows at the tops and for a "ground cover". ~Jute Twine to tie the branches to the cages. ~E6000 glue (from my shop, TJBS) to glue the top loose stems of the cages to make them more secure and stable! I do hope you'll make some for your home!! I hope to share more about the store soon, but for today, this is my share! I hope you enjoyed the tutorial. Thank you so much for stopping by! Beautiful Christmas trees Jules, and thanks for the video. WOUWwhat an awesome project, you´ve been doing here Jules, and it looks fantastic. I´ve never seen these tomato cagfes used here, as we just use to tie them up with some strings, but they sure works perfect for this use here, and looks really awesome. You´ve done an outstanding job on these hun. Mixed Media "2014" Cutting Board Calendar!